West view of the old, 13th-century Cordoba Cathedral (Capilla Mayor) built within Al-Hakam II's section of the Great Mosque. At the east end stands Villaviciosa Chapel and the Royal Chapel. Villaviciosa Chapel was used as the cathedral's sanctuary until the construction of the 16th-century cathedral. The king who oversaw its construction, Alfonso X the Wise, was once enterred at the east end of this nave in the Royal Chapel. 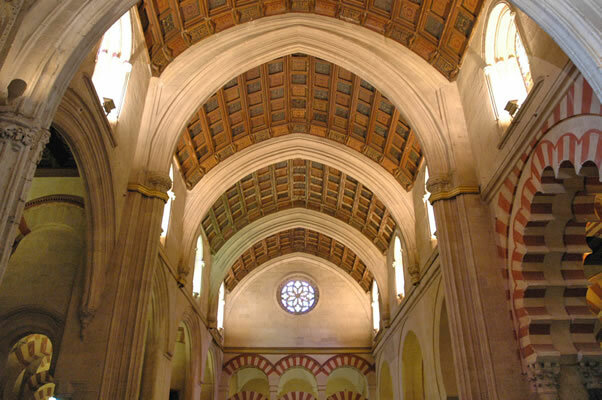 This ceiling is a rare example of gothic carpentry in Spain.